The Sabbath, as it has been observed over the past 2,000 years, has two elements: the positive elements involve the observance of the celebration, while the negative involve the observance of restrictions. The positive elements define the aura of the day. The first of these is the Kiddush. This is the sanctification of the day – the marking of it as holy. 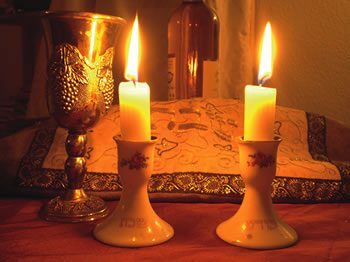 Before the Sabbath begins there is a candle-lighting ceremony. 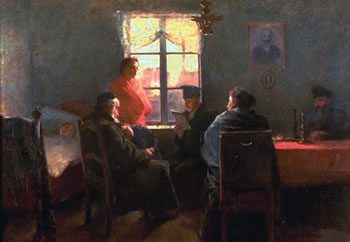 This was instituted in Talmudic times to enhance the spirit of the Sabbath by ensuring every home would have light and warmth to enjoy the occasion. To fulfil this requirement, two candles are lit in all Jewish homes -- some choose to light more – one for each child, for instance. Once they are lit, there is an obligation to enjoy and celebrate the light. Blessed are You God, King of the Universe, Who sanctified us with His commandments and favoured us, and gave us His holy Sabbath, in love and favour, to be our heritage, as a reminder of the Creation. It is the foremost day of the holy festivals marking the Exodus from Egypt. For out of all the nations You chose us and made us holy, and You gave us Your holy Sabbath, in love and favour, as our heritage. Blessed are you God, Who sanctifies the Sabbath. These two aspects of Sabbath observance are revealed twice: once in the Book of Exodus 20:8 -- “Remember the Sabbath day, to sanctify it,” and in Deuteronomy 5:12 -- “Observe the Sabbath day to keep it holy. Sanctify it.” These perspectives point to several distinctions between the two exhortations. The first distinction is about ‘positive’ observance -- celebrating the day, including festive meals, directly fulfilling the day by stating the verses of sanctification. These verses formally fulfill the Exodus reference, with a prayer over a cup of wine to sanctify the day. 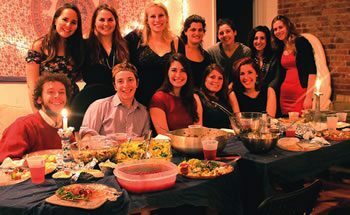 Two ideas are reflected in the idea of observance, which are imitated in the formal liturgy of Kiddush. One is a testimonial commandment -- to remember the Exodus from Egypt. The other is to remember to celebrate God’s creation of the world -- the six days of creation, followed by a seventh day of rest. The second Sabbath distinction is about the ‘negative’ aspect of observance: these are the restrictions indicated in Deuteronomy, involving safeguarding and observing the Sabbath to keep it special. The Torah lists 39 activities defined as ‘creative labour,’ which correspond to the activities for constructing the Tabernacle in the wilderness. For example, a series includes numerous categories involved in making fabric -- shearing, spinning, weaving, dying wool etc. Another series involves procuring dyes -- planting, harvesting and processing plant matter. These examples of creative labour signal human dominance and manipulation of the earth to produce its goods. As the Sabbath is about God’s creation -- all existence, all nature given vitality by God -- Jews desist from any expression of human dominance. Another Sabbath restriction involves cooking: cooking is forbidden, as it is an example of creative labour. Cooked food has to be prepared the previous day. This practice is not difficult when cold meals can be served, but is potentially awkward when hot food is required. Food needs to be prepared and kept warm for up to 24 hours without spoiling. 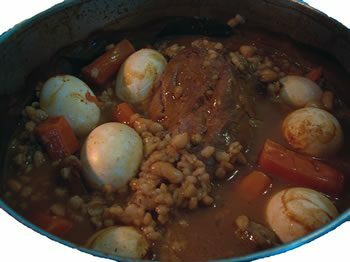 Recipes suited to this constraint have developed, such as Cholent, which is made with beans, barley, wheat kernels, meat -- when affordable -- and potatoes. Today, with crock pots and similar technology, keeping food warm isn’t difficult. In the past, however, various means were used. Often Jews would take their Sabbath meal to the local bakery to keep warm in the baker’s oven as these ovens retained their heat for many hours, even when not in use. Blessed are You, God, King of the Universe, Who makes a distinction between sacred and mundane, between light and darkness, between Israel and the nations, between the seventh day and the six working days. Blessed are you, God, Who makes a distinction between sacred and mundane. 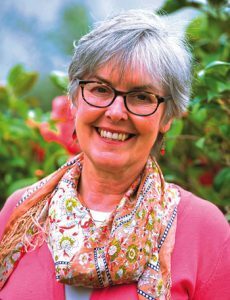 Many thanks to Rabbi Yitzchak Mizrahi of the Wellington Jewish Community Centre for his help with this article.